Internet Explorer 11 (commonly abbreviated IE or MSIE) is a fast, fluid and secure web browser, developed by Microsoft which comes built-in with Windows OS. It was officially released on 17 October 2013 for Windows 8.1 and on 7 November 2013 for Windows 7. It includes new capabilities to improve real-world Web site performance, support for the well-defined and commonly used features of the emerging ECMAScript 6 standard, support for WebGL, and high quality, power efficient HTML5 video without plugins. 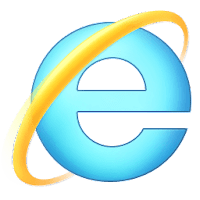 Internet Explorer 11 is available for Windows 7/8/Server versions and has been discontinued for the new Windows 10 web browser - "Microsoft Edge". The browser was also shipped with Windows 10 on its release on 29 July 2015, but Microsoft Edge is the default browser in this version of Windows. Note: for all languages and OS visit IE download center. Disclaimer: Direct downloads for the lastest version of Internet Explorer 11.0.45 (11.0.9600.10586.0) are provided by the official software's author, we can't guarantee safety, availability or download speed. Moreover, we don't and we won't provide any pirated/illegal versions or tools. We recommend you to avoid it as these methods can harm your device. If you like the software, buy it to support the developers. (We provide software discounts for many worldwide brands).